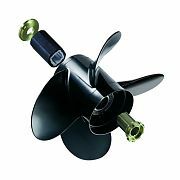 A high performance aluminum propeller utilizing the XHS Xchangeable hub system, Vortex propellers feature high performance blade geometry, precision balanced blades and high gloss powder coat. Vortex propellers utilize the XHS Xchangeable hub system, making them interchangeable with the Mercury Flo- Torq II system. Available for a full range of applications (20-70 HP to V6/V8; 3-Blade and 4- Blade), the Vortex propeller is a great choice for a replacement or spare propeller for boaters. Evinrude/Johnson 200 & 225 HP (4-Stroke) Outboards. 4-3/4" gearcase. Thru hub exhaust & 15 totoh spline. Evinrude/Johnson 90-300 HP Outboards. V-6 (4-3/4") gearcase (Includes E-Tec Engines) Thru hub exhaust & 15 tooth spline. OMC Model 800, King Cobra, Cobra, Sea Drive. 4-3/4" gearcase. Thru hub exhaust & 15 tooth spline.